Jupiter is the bright point of light you see in the eastern sky during the early evening hours this November: It will be the brightest astronomical object you’ll see this month, other than the moon and the sun! You should be able to see Jupiter and up to four of its large moons through any telescope — even through a pair of binoculars. 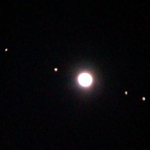 These four large moons move so quickly that if you observe Jupiter’s moons every few hours you’ll see that they change their position in relation to the planet. For example, if you observe Jupiter shortly after sunset you might see one or two of its large moons, but if you observe Jupiter a few hours later you might see all four of its large moons — or vice versa! Currently, Jupiter is in the constellation Aries. Mars rises late at night — well past midnight — over the eastern horizon. The red planet is in the Name A Star Live constellation Leo this month. Saturn rises shortly before dawn over the eastern horizon, and is in the Name A Star Live constellation Virgo. Mercury and Venus are close to one another, low over the western horizon at sunset during early November. Then, beginning about mid-November, Mercury sinks farther and farther down toward the western horizon, disappearing by the end of the month. Venus moves through the Name A Star Live constellations Scorpius and Sagittarius in November. Moonlight ‘drowns out’ the faint light of many stars and other celestial objects, so the best time to view the stars is when the Moon is not visible. If you’re going to stargaze between sunset and midnight, then the best time to do that in November would be during most of the latter half of the month. Stars are located within constellations, which are just areas of the night sky. Scorpius, Aries and Taurus are examples of constellations. Your Name A Star Live Star Certificate displays the name of your constellation. You can use our online World Constellation Guide to determine if you can see your constellation during the evening hours (between sunset and midnight). Of course, you’ll need a telescope to see your star. (That’s why we include the SLOOH online telescope experience in our Deluxe, Framed and Ultimate Gift Sets!) But you can see your constellation without the use of a telescope. You can also find your constellation by using our Virtual Planetarium™ astronomy software. A planisphere is another useful device.